At the beginning of the game, the teams are provided with identical servers with preinstalled set of vulnerable services. The teams’ aim is to detect the vulnerabilities, fix them on their servers, and exploit them to obtain sensitive information (capture the flags) of the competitor teams. Teams can also score points by capturing bonus flags or flags from the shared game infrastructure, or by holding down services during the King of the Hill contest. Each flag represents a 32-character string in the MD5 format. Note: services for the ‘King of the Hill’ contest are divided into two levels; access to the services of the second level is provided only after the first-level tasks are solved. Holding down the second-level services scores more than that of the first-level services. A final contest will challenge the competitors’ skills and knowledge of protecting certain infrastructure from Internet attacks. The detailed information about the contest will be provided on the second day of PHDays CTF 2012. Teams’ performance at this contest can influence their final rating. 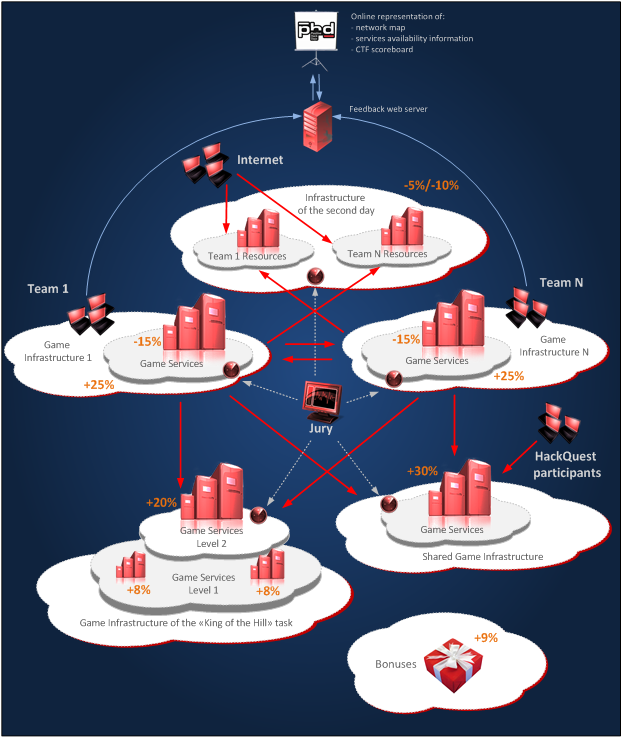 The game process is constantly monitored by the jury’s supervising system, which regularly modifies the state of the game infrastructure by adding new flags and vulnerabilities to the teams’ servers, and checks the state of the previously added flags and the functioning of vulnerable services. The jury decide the winner on the basis of total points scored by each team. Winning the bonus contests (the Bonuses rating). All flags on the teams’ servers are distinct and are marked with an identifier unique for each team’ services; each team may capture flags from all competitor services. Flags on the servers within the shared segment differ in their value according to the sophistication level of the task to be solved. The value of each bonus task is pre-set for each service according to the sophistication level of the attacks. Samples of probable bonus tasks: taking over AR.Drone, dumpster diving. Failing to ensure protection of the game infrastructure in the final contest. Red indicator means that the service is malfunctioning (is either unavailable or not performing the predefined functions). Each new check-up will lead to deduction of points until the situation is fixed. The first three losses of the same flag are scored 100% of the flag’s value each. All subsequent losses of the flag are not included into the penalty total. Thus, the maximum amount of penalty points for a flag is the triple value of the flag. For bonus tasks, flags lost by the team are not counted. Note: the detailed description and penalty calculation formula of the final contest will be announced on the second day of PHDays CTF 2012. The points scored by each team are calculated in real-time mode and are displayed on the screen. If a team scores more penalty points than can be deducted, their total score is reduced to 0.
conduct attacks against the services of the King of the Hill contest in order to keep control over the systems. performing the above actions in the guise of a rival team. The jury may specify the rules at any time before the game begins. The jury may impose a penalty/disqualify a team for a foul. The jury decide the winner by calculating the total scores. The score distribution over the tasks is expressed as percentage of the total score possible for the CTF. When completing the final task, teams can lose some scores (the details will be provided on the second day of the contest). Configuration errors in servers and applications.